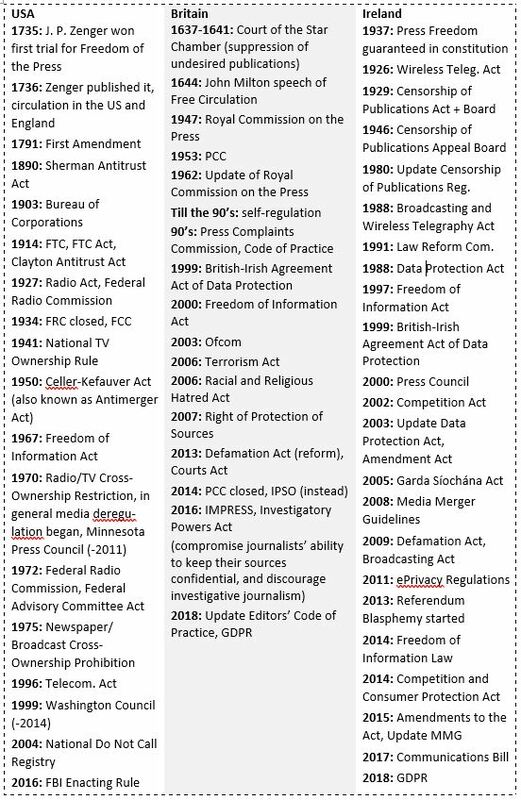 In this section different approaches between USA, Britain, and Ireland has been examined regarding the different time frames in which media regulation took place, regulation bodies, principles, and controllability. All of them summarized in a table for a greater clarity. Freedom of Speech, as a starting point of media regulation, will therefore always be one of the main topics regarding press regulation. Currently, Ireland is on place 16 (from total 180) of the World Press Freedom Index of 2018, the United Kingdom is on place 40 and the United States are on place 45 (RSF, 2018a). The ranking shows how the countries deal with those seven indicators: Pluralism (degree of opinion representation), media independence, environment and self-censorship (operation environment of the media), legislative framework, transparency, infrastructure (included violence against journalists and media), level of abuses (RSF, 2016). In some countries exist long established press councils (e.g. Britain), in some countries the press council is relatively new (e.g. 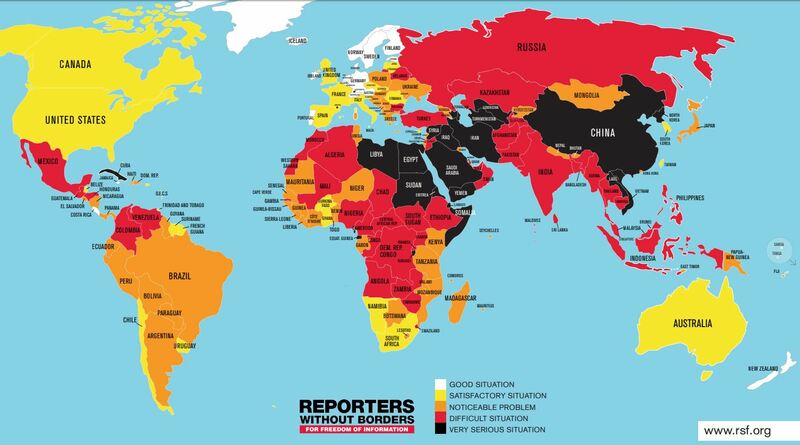 Ireland) and some countries don’t have any press council (e.g. USA). Why do some countries don’t have a council that handles everything around the press? Reason can lay in the politics, economics, legalization or in the culture of the country. In the USA it is mainly because of the existing law system that they have, which handles a lot around media/press regulation. Some countries have ombudsmen, which are (mostly senior journalist/media) people who handle complains and recommends remedies. Since 1967 ombudsmen exist in the US as well, which is in comparison to e.g. Japan (1922) relatively late (ONO, 2018). 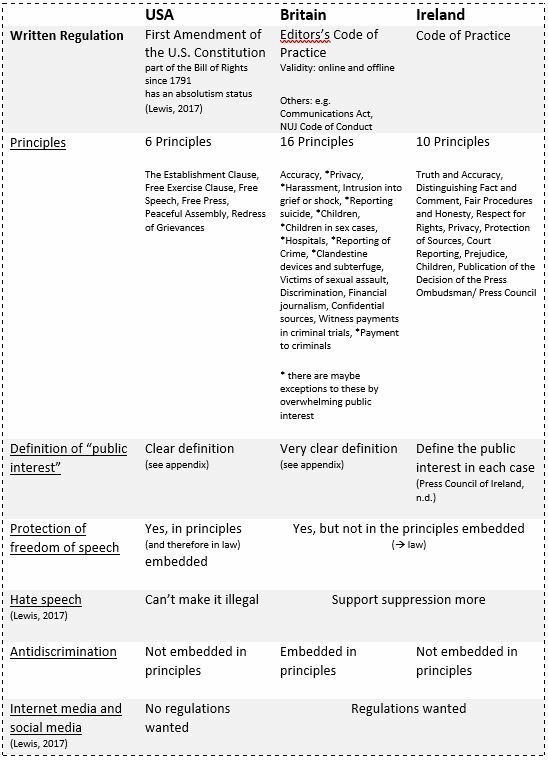 The main differences in the written principles are (1) where they are embedded, (2) range of validity, (3) number of principles, (4) content of the principles. In the USA they are embedded in the law system, unlike the principles in Britain and Ireland (UNESCO, 2014; Lewis, 2017). As distinguished from USA and Britain, Ireland has one extra principle regarding the media regulation of the regulatory authority and complain body of the country. Another interesting point is that because the freedom of speech is embedded in the law (= principles) in the USA, they can’t forbid also negative outcomes of freedom of speech, like hate speech (Lewis, 2017). With a closer look to online media/social media regulation in those three countries, we can see a hugely different approach between USA and EU (Britain, Ireland). The USA decided to not regulate or tax it (Lewis, 2017), but it exists a copyright clause: the Digital Millennium Copyright Act, since 1998 (UNESCO, 2014). This Act supported the fundamentally no-restriction attitude because it enables the USA to restrain publications. Lewis (2017) opinion is that the pressure mainly comes from the Silicon Valley and all the big firms there: “Silicon Valley executives hate regulation and will move to block it”. As a result, the frustration level in the EU is high, which wants to regulate them. Their latest statement was: “regulate yourselves (and not just a charade), or we will regulate you” (Lewis, 2017). In Europe, the E-Commerce Directive handle internet intermediaries so far (UNESCO, 2014). The market is through ownership concentration controlled in all three countries. Differences occur in the different ways of content control. 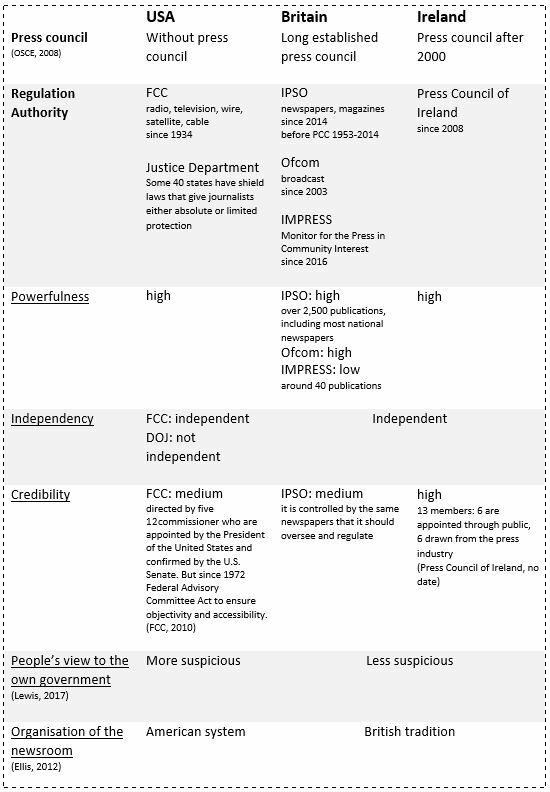 The US, the UK, and Ireland have a high to very high concentration of media plurality and ownership even though all of them have some restrictions on this issue. It is an ongoing concern. Britain and Ireland are one of the main regulated countries of western Europe. In general counts everything above 30% of the market share that is owned by one person as excessive. “In Europe, […] the main national and regional newspapers are typically divided between less than a half dozen owners. In the United States, there are more groups, but a small number have a very dominant position in the large city and regional press.”, so McQuail (2010). In the USA Bertelsmann counts as the most suspicious case regarding ownership concentration. He owns over 30 radio stations, 280 publishing outlets, and 15 record companies (University of Minnesota Libraries Publishing, 2010). In the UK 60-70% of the market is controlled by three companies, mainly newspaper publisher (RSF, 2018d), one of the famous person is Rupert Murdoch, who owns The Sun, News of the World, Daily Mirror (Brady, 2018), Times, Sunday Times, Sky Television, BSkyB and eventually more. In Ireland most is owned by Independent News and Media (INM) and RTE (Freedom House, 2016). As an example, the FCC of the USA have the restriction that one person can (only) own one of the top-four local television stations but many undermine this restriction through Merger and Acquisitions or Joint Ventures (Freedom House, 2017a). In Britain exist the regulation that broadcaster can (only) own a limited amount of newspaper interest. This doesn’t include interest in satellite broadcasters (McQuail, 2010). In Ireland, one of the restrictions is that it is not allowed to own one of the fourth biggest radio and TV firms if you already own one of the biggest newspapers (Smyth, 2018). Content control is in each of the European countries/ states different. Each state of the EU has different rules under the umbrella of the EU rules. In the EU you don’t sell your product once, you sell it per country, e.g. once for Germany and once for Ireland (Smyth, 2018). In the USA in all the states the same, you sell your product (e.g. a movie) license only once to the country. Content control through accessibility differs between the USA and Britain/Ireland. In the USA the accessibility is befallen to be sometimes restricted. In the UK and in Ireland not (Freedom House, 2017b; Freedom House, 2016). For meaningful statements about media control through cultural conditions, further research is necessary. All countries had in the past restrictions of book publishing and selling, all of them still have restrictions to pornographically content. In Ireland has been a banning of creative content from 1923 to 1940, which also led that artists and publisher left the country (Smyth, 2018). An up-to-date topic is still the restrictions of blasphemy content which remains as a criminal offense (Freedom House, 2016). Note: this table doesn’t show all Acts, regulations, laws, founding’s of institutions, etc. ; it could be that not all sources are in the list of sources. The reference list is here accessible. All tables are made by Vivien L. Berger, please make sure that you use correct referencing by using them.